Sharing with you another sample card I did for the Dare to Get Dirty challenges at Splitcoaststampers. I love doing this technique so much. This time I used crabs for my negative design. For the background I used Tim Holtz Distress Inks in Scattered Straw, Spiced Marigold, Spiced Marmalade and Ripe Persimmon, then heat embossed with a sparkly embossing powder. The panel is attached on foam dots with some scattered pearls and sequins. 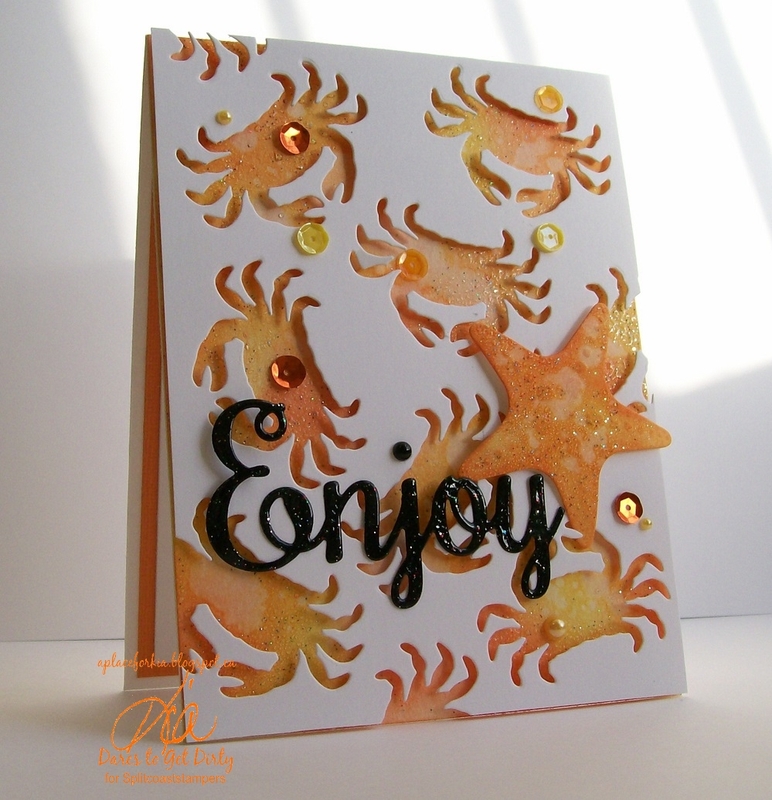 The starfish is done in the same colours as the background and heat embossed as well. I die cut my Enjoy sentiment in black, dipped in embossing ink and added the same sparkly embossing powder to get that awesome shine. My neighbour really loved the Beachy Hugs card I did, so this one was done for her. I love it, and hope you do too. Thanks for having a look today. Products: Memory Box Coastal Crab, Frantic Stamper Enjoy Sentiment, Impression Obsession Sea Shells, Tim Holtz Distress Inks, Embossing Ink, Ranger Rainbow Sparkle Embossing Powder, Sequins, Pearls.